Browsing the internet and various bookstores, it can be difficult to find greeting cards with substance and a clear Christian confession. Our conversations with friends and customers helped us to realize that we were not the only ones facing this dilemma. So, five years ago, we at Emmanuel Press began offering ecclesiastical greeting cards as an alternative to the usual fluff of mediocre art and cliché sayings. Our newest card, Psalm 23 (left), is the first in a planned series of greeting cards combining sacred artwork with the prayerful, comforting words of the Psalms. This particular stained glass is located behind the altar at Redeemer Lutheran Church in Fort Wayne, Indiana. 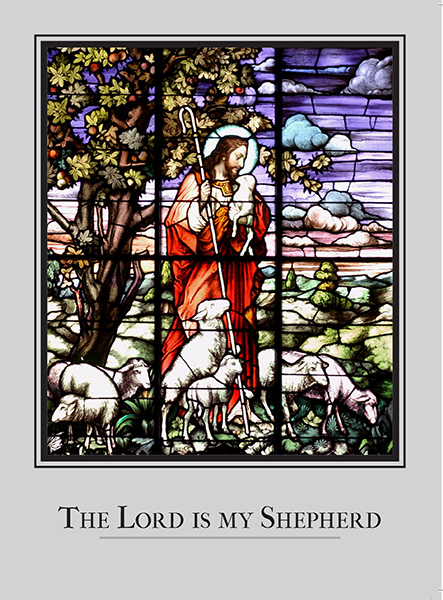 It depicts Jesus, our Good Shepherd, in vibrant stained glass on a light gray background. Psalm 23 is printed on the inside left side, leaving the right side blank for personal correspondence for any occasion. Visit the Psalm 23 page to have a closer look at the artwork and to see the inside text. We are always on the lookout for beautiful sacred artwork! If you know of stained glass or have other artwork or card ideas to share, please contact us. This entry was posted in Latest News and tagged EP Cards, Psalm cards. Bookmark the permalink.